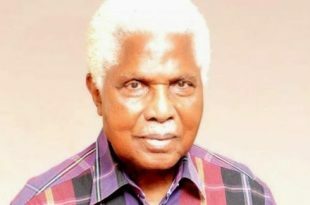 The family of Ex-VP Alex Ekwueme says the former elder statesman is alive and well. In a statement released on Tuesday by the spokesman of the family, Uche Ezechukwu, the family asked the general public to disregard the rumour being peddled on social media about the elder statesman's death. According to the spokesman: "The truth is that the elder statesman is alive and well." The former VP had collapsed in his Enugu residence and was immediately admitted to the hospital. He said: "His condition is not only stabilising but improving considerably"
"In fact, the former VP has moved from a stage of unconsciousness to a state whereby he now receives visitors, sits up and eats." "It is important to inform that Dr Ekwueme is yet to be taken abroad, as the necessary documentation and preliminary are on course and arrangements are being completed." The Presidency had released a statement on Monday where it promised to fly the elder statesman out for oversea medical treatment immediately. The spokesman revealed Dr Ekwueme is still in the country pending the finalisation of his documentations and other arrangements. Ekwueme, who celebrated his 85th birthday two weeks ago, was the first elected Vice-President of Nigeria from 1979 to 1983.